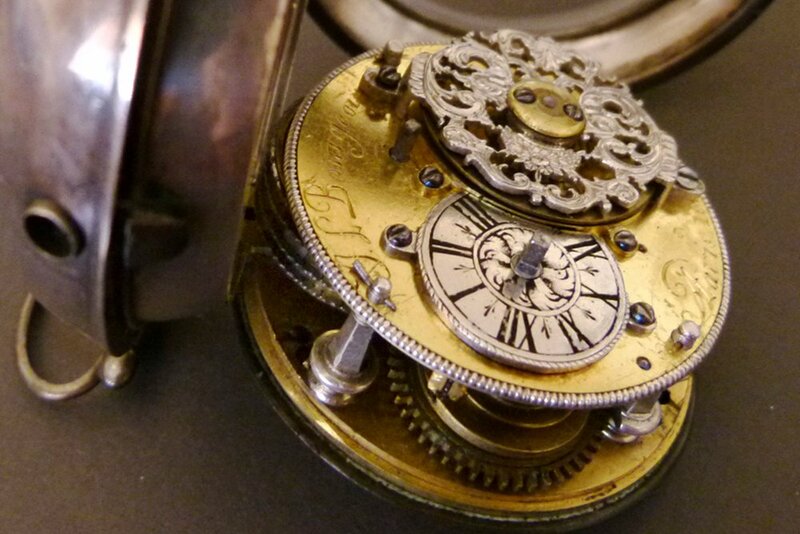 This is the inside of my Grandad's fob pocket watch. I just love the craftsmanship. This watch is one of my prized possessions. Not that it is valuable, but just because of sentimental value. The engraving on the watch says J L Bourgeous, Paris, 1688. J L Bourgeous was a French watchmaker. I would have loved to have been able to ask Grandad where he got the watch from but he died when I was 5 years old. I acquired the watch when my Mum died in 1994 and the watch wasn't working. I took it to a jewellers shop and the watchmaker said he would be glad to work on it for me. He also said he wouldn't charge me if he couldn't fix it because he was just be thrilled to work on a watch this age. Luckily for me he was able to fix it and it is still going strong now. I might add that the watchmaker also wanted to buy it from me, but I wasn't going to let this go was I!! As far as I am aware Grandad never went to Paris and certainly wasn't around in 1688. I often wondered how he came to own it. Did it belong to his father? I don't know. Lovely photo that honors the watch and your Grandad. Beautiful picture and lovely thoughts too. Awesome composition and image...lovely narrative! A FAV! Beautiful in every way. FAV. They don't make them like that anymore. Lovely photo. A beautiful object and great pov. It's wonderful to have these old sentimental things to treasure. I just luv shots of vintage goods, fabulous!! That's a beautiful watch! Lovely story to go with it thanks for sharing it! What a beautiful watch and how amazing that it still works. The watch repairer must have really loved working on it. Beautiful watch and a wonderful shot of it. Superb detail and pov. Fav! @juliac @mcmary @ourrube @chimfa @sunraye @iwatts @lauramalone82 @hermann @888rachel @marie65 @huvesaker @dolphin @joeyc @tracelee @jennyheath @paulaw @sturnus Thank you all so much. I noticed that Grandad's watch appeared on the Trending Page too, briefly. Sorry for the group reply, but I wanted to add something about the watch. The jeweller who fixed it for me was a little old man who was well past his working life, but obviously enjoyed what he did. He also found out all kinds of information about the watch for me, the history of it, what type of escapement it had, history of the maker of the watch. He photocopied all the information for me and gave it to me when I got the watch back. He really was a lovely man. The watch was also missing its key to wind it up and he made me a hand made key for it too. He was such a lovely man. Thank you too to Raye, Ian and Carol for the fav. Just the history of it makes it a fav for me too. What a lovely treasure....beautifully captured. Thank you for sharing this little treasure with us! @eyesmile Thanks for checking it out too. Oh wow Babs but a wonderful story but such a shame you can't follow up on its history more. It looks a wonderful piece and its amazing that after all these years it is still working. Beautifully photographed! @elaine55 Thanks Elaine. It is a shame. I have got plenty of history on the watch itself and the maker, but none on how Grandad came to own it. I was pleased with how I photographed it too. to just take a pic of the face didn't do it justice. Like lots of things there is so much more going on behind the scenes so to speak than on the surface. Beautiful workmanship and wonderful focus on the details. What a mystery. It's beautiful and a lovely lit shot of it too. My Dad has his Grandfathers watch which is beautiful and delicate but spent it's life down the mines with him, encased in a big brass case which we also have. I've asked to photograph it but haven't got the camera and the timepiece together yet... must ask again! @angelat @jaynspain Thanks so much. Only just got round to replying today, so much going on here at the moment. Sorry for the late reply. @angelar Thanks so much Angela. My Grandad was a fireman at the mines in Yorkshire. Don't know if the watch went with him though. Would love to see a photo of your relatives watch, sounds wonderful.